Some 700,000 college students in the Philippines will be graduating and looking for work when the school year ends this month. But only half are expected to land a job. As for the rest, they may have to wait at least two years, according to senior Philippine officials. More than any other barometer of economic health, unemployment reflects the reality that while the Philippines seems to be experiencing an economic boom like never before, prosperity has been far from being "inclusive". The unemployment rate rose to 7.5 per cent in January this year from 7.1 per cent a year earlier. This means that out of the country's 39.41-million-strong labour force, 2.96 million Filipinos are jobless. They add to an even bigger army of seven million underemployed people, such as street vendors, farmhands and jeepney drivers, who do not get regular salaries and employment benefits. 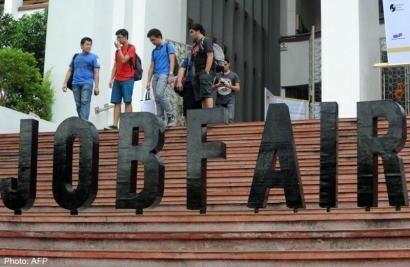 "It's not easy to dampen the hopes of new graduates, but based on this data we do not see college graduates finding a job right away," said Mr Alan Tanjusay, a spokesman for the Trade Union Congress of the Philippines. Labour Secretary Rosalinda Baldoz said the simple fact of the matter is that the Philippines is not creating enough jobs. There were 974,000 new jobs in 2010, 1.16 million in 2011, 408,000 in 2012, 317,000 last year, and only 283 so far this year. But some 1.5 million enter the labour force each year, which explains why the jobless rate has stayed stubbornly within the 6 to 7 per cent range over the years. Last year's natural disasters bumped up the figure to 7.5 per cent as of January this year. Typhoon Haiyan last November, the strongest typhoon to hit the Philippines in recorded history, displaced some six million, nearly half of whom were already without a regular job. Ms Baldoz said what makes the situation worse is that it takes a college graduate at least a year to find his first job and two years before he lands a regular one. Filipinos with just a secondary education may take up to four years to land a regular job. Of the 700,000 college graduates each year, half will quickly find work in the booming outsourcing and manufacturing sectors. Most of those who do not find employment will look overseas, while 60,000 will be counted out of the labour force. "It has something to do with job mismatch," said Ms Baldoz. "In most cases, a college graduate lands a job he didn't even study for." She said one bright spot in the employment picture is that the proportion of so-called self-employed and unpaid family workers against the total labour force shrank from a steady 51 per cent since 1999 to less than 40 per cent last year. This means the number of workers with regular salaries and employment benefits is growing, said Ms Baldoz. "This shows our economy is experiencing a very palpable shift," she added. Overall, however, the recent boom is unlikely to make a dent in jobless figures, at least not until 2016. "The majority of Filipino workers would still be left out," said Mr Karl Chua, the World Bank's senior Philippine economist. The number who are unemployed, underemployed or have to work in the informal sector is expected to rise from 10 million last year to 12.4 million by 2016, he added.